- 7"(1024 × 600) capacitieve (5 punten) touchscreen TFT LCD, megapixel CMOS-sensor camera met privacy sluiting. The GXV3275 IP Video Phone with Android delivers a powerful voice, video and multimedia business communications experience to keep workers in touch and up-to-date. 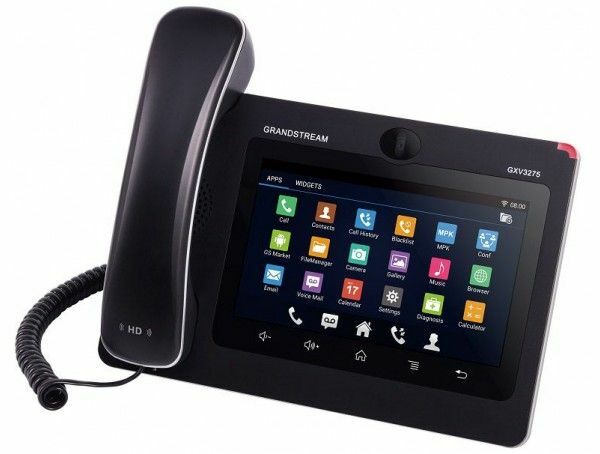 Allow users to stay connected using its 6 lines, multi-platform video conferencing support, tablet-like 7 inch touch screen and app integration through the Google Play Store. Stay productive and customize your phone with access to thousands of android apps, including powerful business productivity apps like Skype and Google Hangouts. Additional features include integrated Bluetooth for pairing of headsets and mobile devices for contact book/calendar exchange and call transferring, Gigabit ports, integrated WiFi, and more.